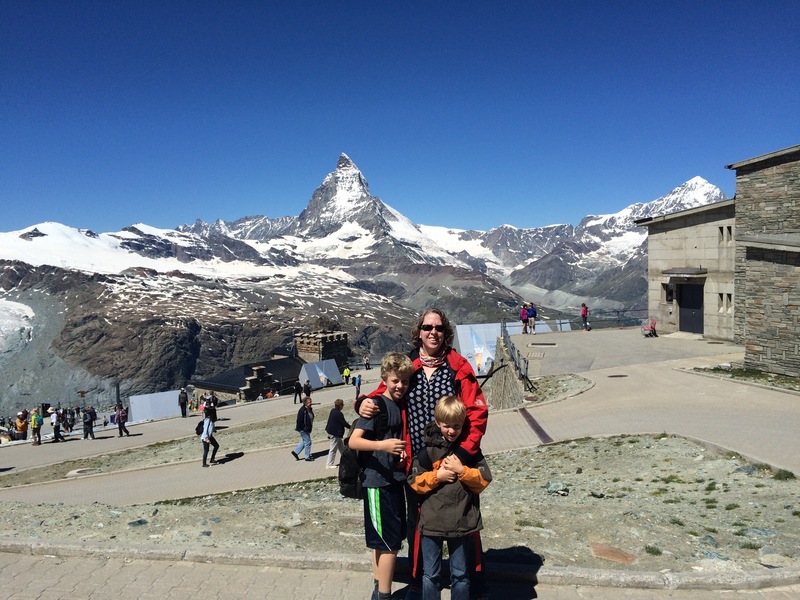 The Swiss Family Carlson Climb the Matterhorn! It seems incredible that summer break if finally here. It was a long time in coming here in Switzerland. We only get an 8 week break, but I’m sure it will seem adequate by the time school starts at the end of August. 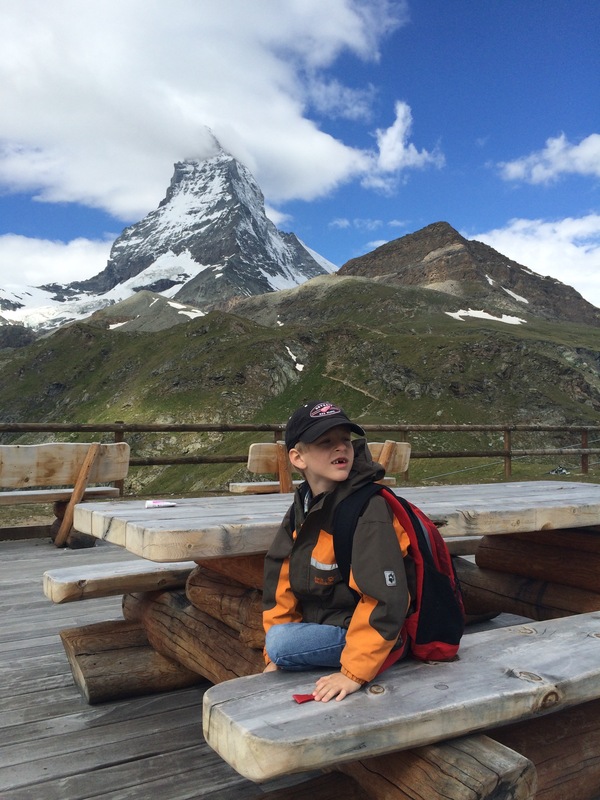 To help the time pass we spent a long weekend in Zermatt. 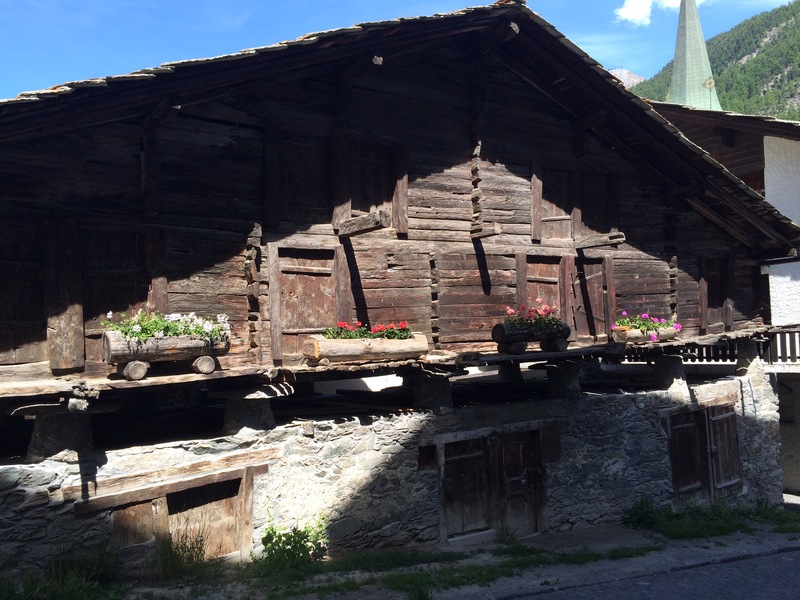 Zermatt is a cute little village at the foot of the Matterhorn. The Matterhorn is one of the most famous mountains in the Alps. Its north and east faces are incredibly sheer. It looks like the snow has been lightly spread on with a butter knife. One of the legends says that it was the walking stick of God that got stuck when He was walking through the Alps reviewing His creation. He tried and tried, but He ended up breaking His stick. 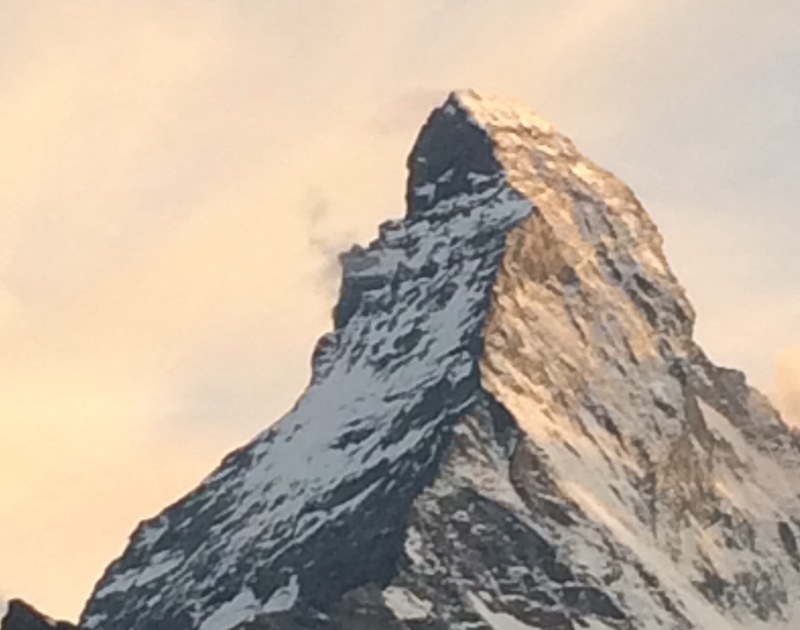 Then a giant, who lived on the Italian side of the Alps, got curious about what was going on in Switzerland, so he stepped over, but ended up smooshing part of the Matterhorn and gave it a sheer side. 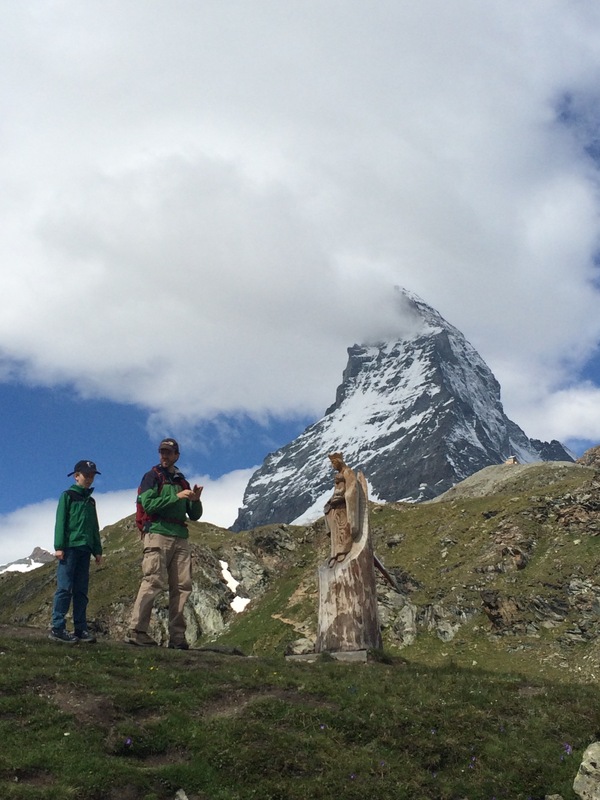 The Matterhorn stretches 4,477.5 metres (14,690 ft) into the air. It stands alone and completely dwarfs the hills around it. And it’s just breathtakingly beautiful. It was the last of the mountains in that region to be successfully climbed. Edward Whymper and 3 companions and 3 guides made it to the top in 1865. Unfortunately, only Whymper and two guides out of the 7 men who made it to the top that first time actually made it back down. They were belaying down when one of the main climbers slipped, knocking one of the guides off, and pulling two other climbers with them to their deaths onto the glacial pack 1200 meters below. Over 500 climbers have died trying to make it to the top or come back down. A sign giving cautionary tales of ill-fated climbs tells about a pair of Germans wearing track suits who thought they would just run up to the top. They had to be rescued by a helicopter. It is beautiful and imposing and we couldn’t stop looking at it. We had a great view of it from our balcony and we would sit there staring at it in the evenings. 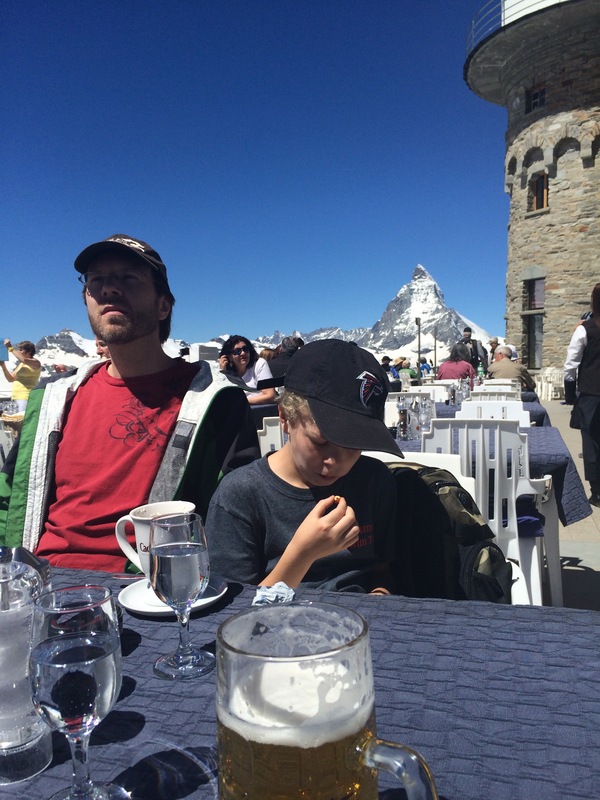 Mark and I asked ourselves, “How many pictures of the Matterhorn is too many?” The world may never know. 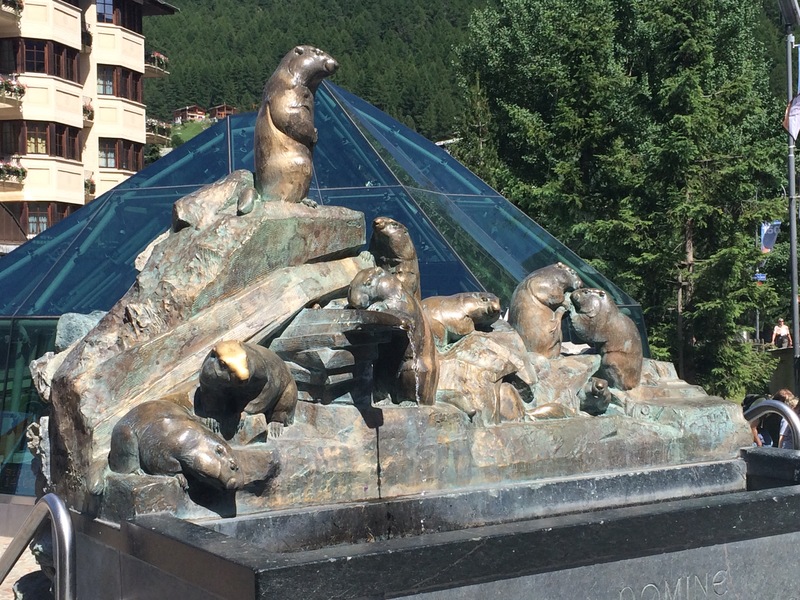 We spent our first half day just seeing what Zermatt was all about. It is a lovely town. With an economy built around outdoor tourism, it has more outdoor sporting goods stores per capita than any other town I’ve ever been to – Northface, Jack Wolfskin, Mammut, and at least 15 other local shops. It also has a lot of restaurants, about half of them Italian and all of them expensive. E was extremely pleased to have a diet of pizza and pasta for the weekend. The rest of the buildings seemed to be hotels and condos. Commercial, but really lovely for a 3-day weekend. Marmets. Know them. Fear them. 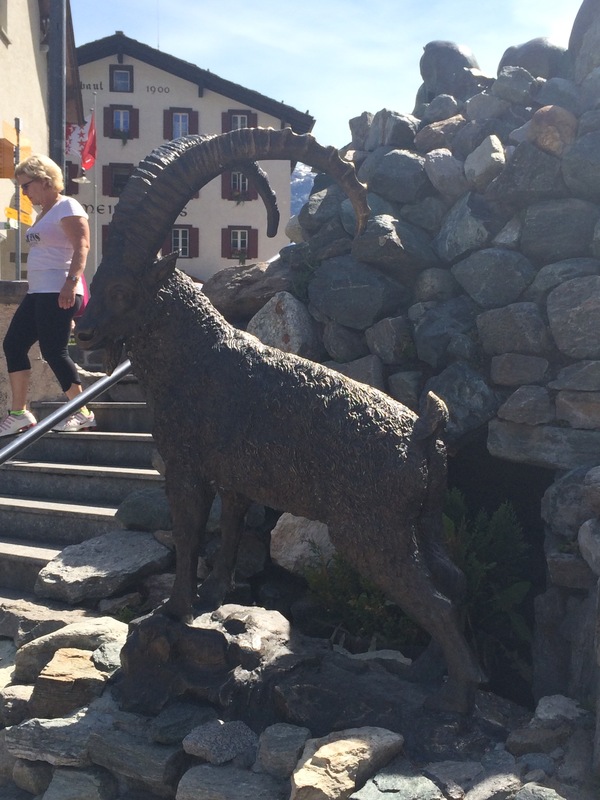 A statue of a Steinbock. Just so you know when you see it live and in person. 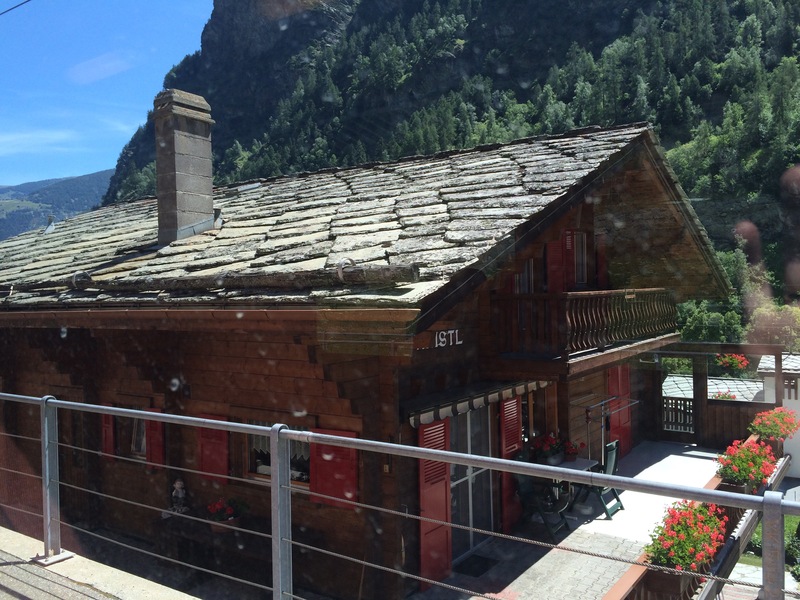 An original house to Zermatt. They are built on stilts to keep the above the snow. A more modern house built in the same style. If it ain’t broke, right? Of course we decided to hike. We had several options: a hike to the east up past 5 lakes from Sunnegga to Fluhalp; taking the train up to Gornergrat straight to the south and then hiking down to Riffelert or Riffelalp; and finally going to the west and taking the funicular up to Schwarzsee and hiking back down into the center of Zermatt. We settled on hiking down from Schwarzsee. Just look how easy it looks on the map! It looks like a fairly straightforward hike, the guidebooks called it “good for families,” and there is a cartoon sheep leading the way! Done! Mistake #1. Trusting a cartoon map. We got the boys’ hiking boots and light jackets on and set off to find the funicular. 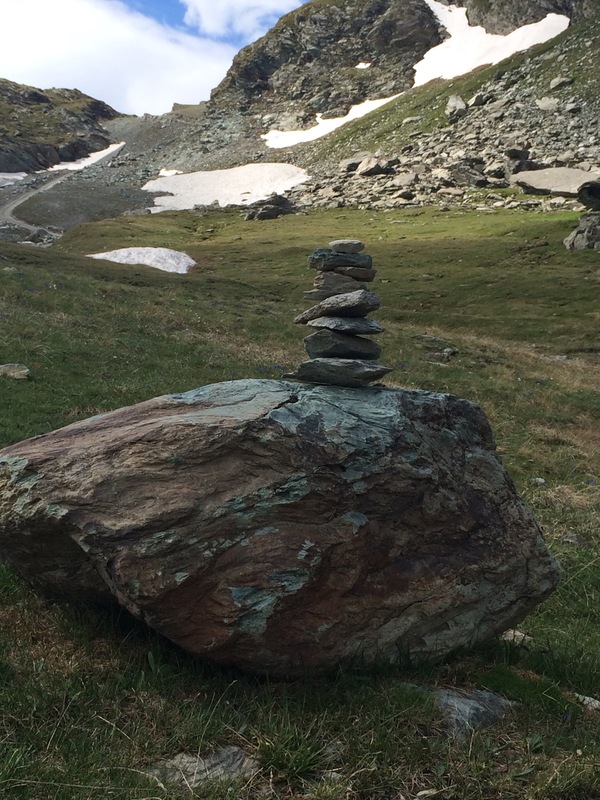 It was somewhere in the west half of Zermatt. Naturally we walked. The main road was by the river, a milk-glass blue color that I had a hard time looking away from. We followed that around until we came to a fork in the road. We went left. After about 10 or 15 minutes we found the youth hostel, not the funicular. The director of the youth hostel told us we should have gone right, so we went back down the hill with our two new friends Zara and Karina, a mother/daughter team from Indonesia, and found the funicular. It was a glorified and encased ski lift. The children held onto me for dear life while Mark snapped pictures. The ride was uneventful and beautiful and we made it up to Schwarzee in under 20 minutes. The funicular even slowed down long enough for us to get out with some dignity. E is crushing my ribs. 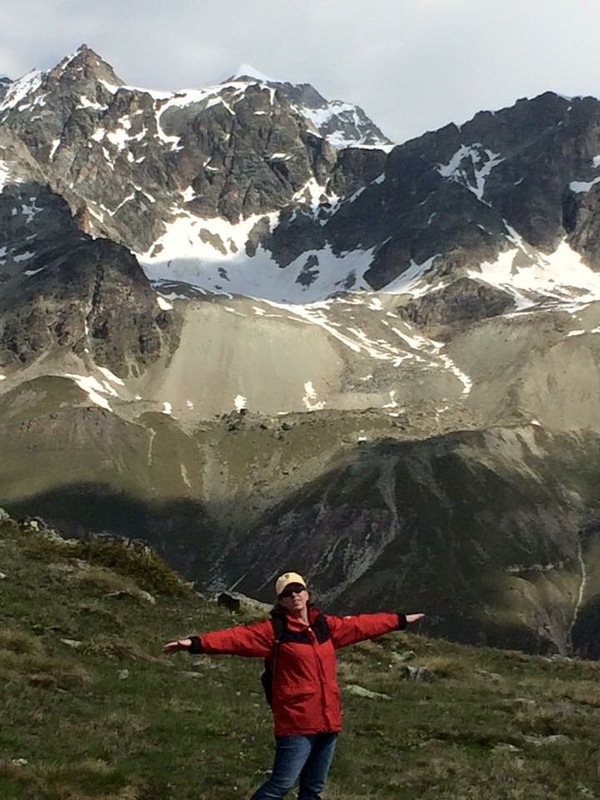 I am remembering the hike in two parts: The Hills Are Alive! and Eff This! Lord, was it beautiful! 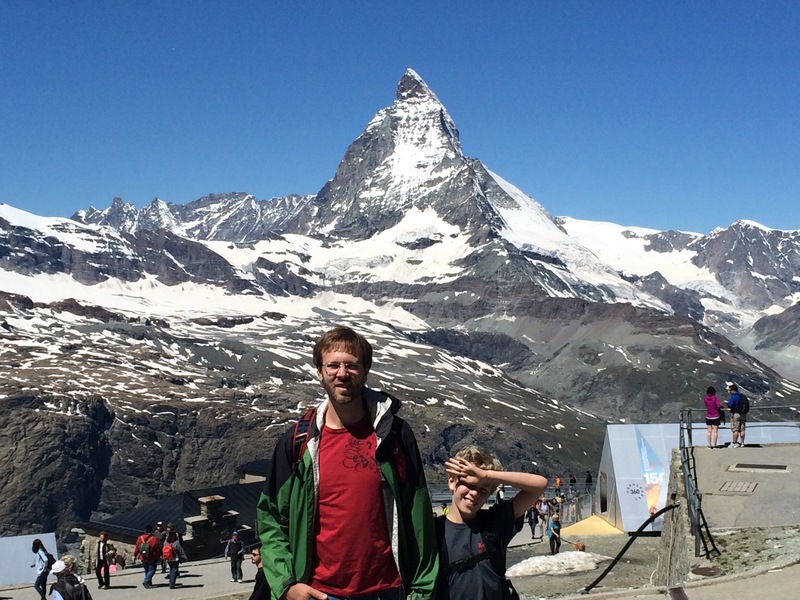 We were right there at the foot of the Matterhorn! The sky was impossibly blue with fluffy white clouds and it was just cool enough to make hiking very comfortable. We wandered around the top and tried to memorize the view. H spotted a restaurant and once we shot down his request of ice cream at 10am he decided this was the most boring thing ever. Until we started to walk and we let him go through the meadows instead of having him walk on the path with us. Then it was delightful. 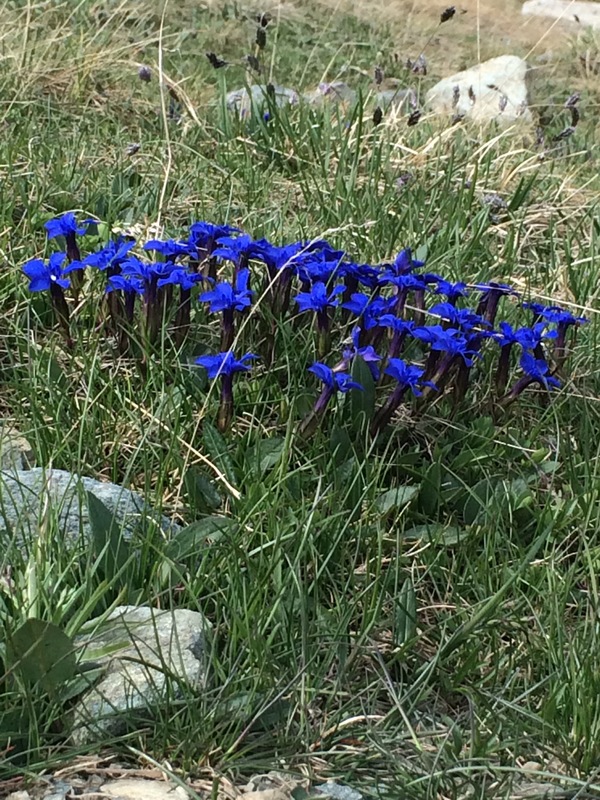 It is the end of June, but it’s spring in the Alps. There were buttercups, violets, and other flowers I’d never seen before. We could hear the clank of cow and sheep bells around the hills. Streams were running with the melting snow from the mountains and we could see some of the melt cascading off the mountains in waterfalls. E became obsessed with Pure Glacial Water. He needed to drink some. NOW! So at an available stream he dumped out his perfectly good Zermatt hotel water and filled his bottle with Pure Glacial Water. He was extremely triumphant. We found these stacked rocks everywhere! All along the Schwarzee path and even at the top of Gornergrat the next day. Paying homage to St. Mary of the Snow. 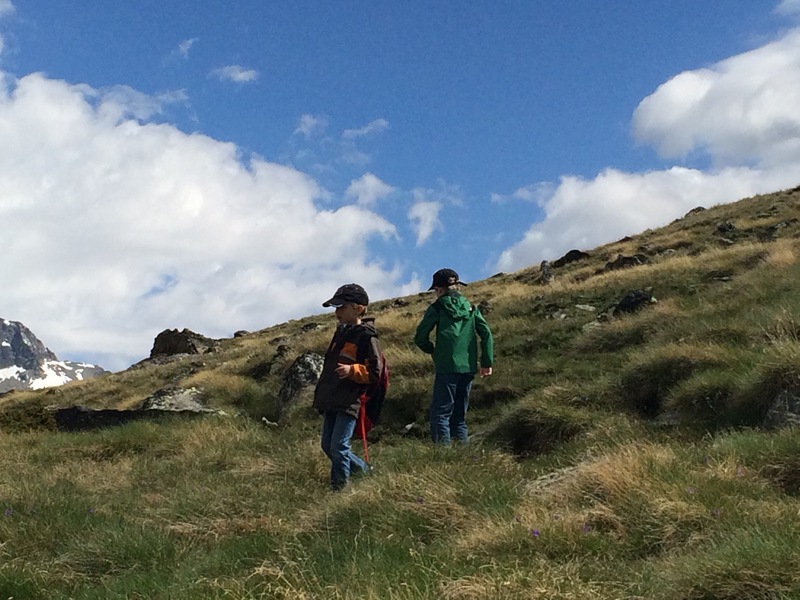 The boys were jumping from rock to rock and Mark and I were having a lovely hike down the biking path and onto smaller foot paths. The big highlight was having to jump over a stream to make it to Stafelalp, a restaurant in the middle of nowhere, for lunch. Lunch was relaxing and much needed. Especially since after that we get to…. All this time we’d been going downhill. Sometimes more downhill than others, but it was still down, down, down. You may not know, but that is very taxing on your quads, hips, and knees. Plus, your feet tend to slide forward in your shoes and your toes press against the front of your shoes, making them sore. We weren’t sore yet, but we were getting fatigued. The boys were game to continue, but we could tell they were getting a little tired as well. The hills were still green, the streams were still rushing, and the path was still smooth. However, the path was more downhill than before, I had to pee which the sound of rushing water wasn’t helping, and the green hills were treeless and allowed the sun to hit us full-on. We came to another fork in the road. 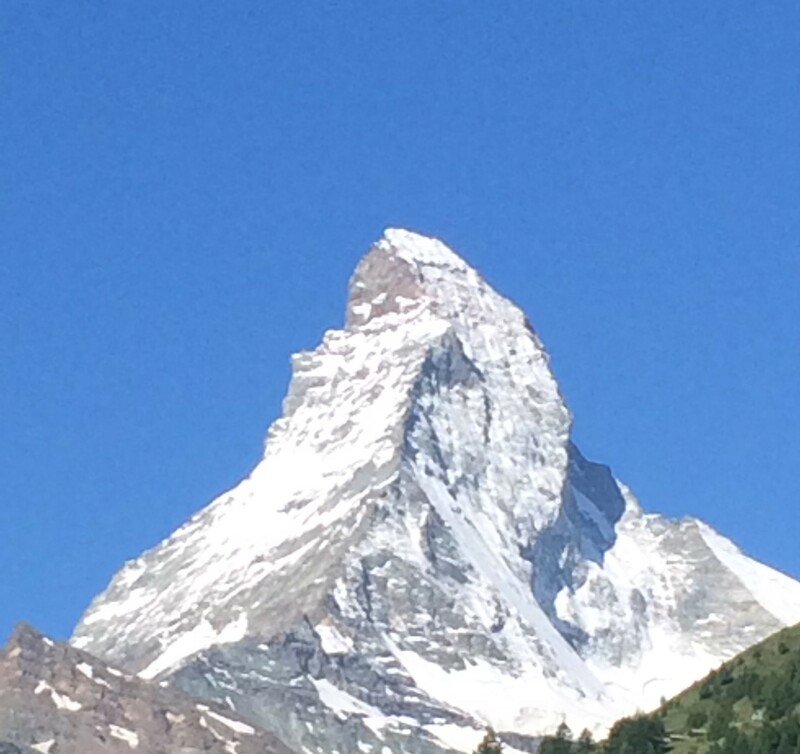 The arrow to the left said Zermatt. The arrow to the right said Furi and Funicular. 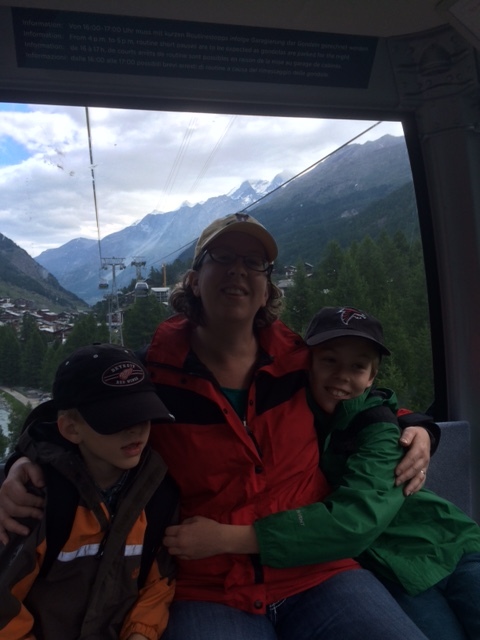 So, we could end the hike a little early and buy a ticket for the funicular down to Zermatt. 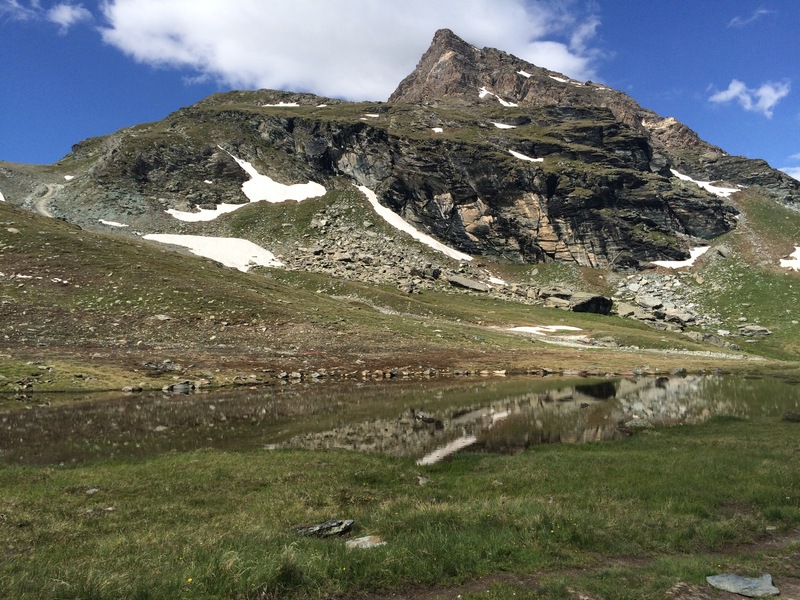 Or we could just keep going – walk over the dam just to our left and keep moving around the hills and cow pastures into Zermatt. Mistake #3. We went left. The dam was holding back the milk-glass blue water. Wind gusts were blowing through our coats, cooling us off. And then H’s Detroit Red Wings hat blew off. Mark made a dive for it and caught it, literally 2 inches from disappearing into the gorge. He also ripped out the knee of his pants. We continued, holding our hats tightly in our hands, and went into the green pasture on the other side. We didn’t know it, but we had gone from one mountain to another. The path just went on and on; down and down. After another hour of hiking my quads were screaming, my knee felt like it was going to tear, and I still had to pee; E was declaring with every third step his legs were “going to burst” and proclaiming with every sixth step the superiority of his Pure Glacial Water; Mark was asking for a moment of silence to mourn his ripped pants; and H was laying on the ground lamenting that he’d never have another playdate ever again because we were never going to get home. At least the landscape was still gorgeous. We made it to Zmutt, a town of approximately 6 buildings, and kept going. We were too tired and fed up to do more than acknowledge that we had reached a town and keep moving. 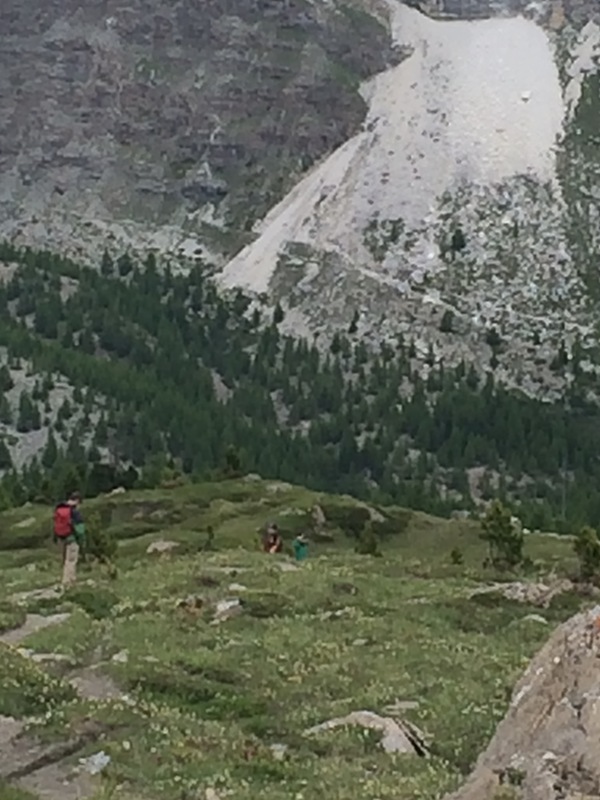 We made it to the pine forest and kept hiking down until we reached Zermatt another hour later. That’s 4.5 hours of hiking and 16km. Beer and ice cream. 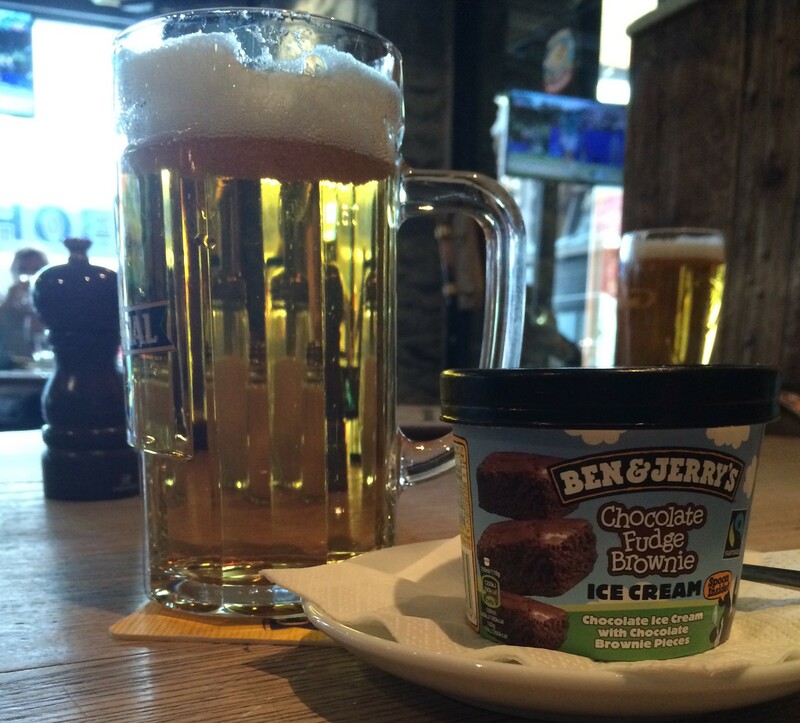 Yes, they are civilized enough to serve ice cream in a pub here. We treated ourselves with beer (the adults) and ice cream (the children) at a local pub and then limped back to the hotel room for a rest. It wasn’t until we tried to get up and walk to dinner that we realized just how much trouble we were in. My knee was having trouble moving. My big toe on my right foot felt like it had been stomped on repeatedly by a horse. Mark’s legs were seizing up as well and the boys were just tired, tired, tired. We didn’t have to walk too far and we found a great traditional Swiss restaurant. We got fondue for 3, chicken nuggets for H, and a starter of raclette for E. We ate way too much, had a great time going over the hike with the boys, and then limped back to bed. The children went to sleep in record time. Who knew it only took a 20km hike to get them to sleep in under 10 minutes? We were still sore, but not immobilized. It turns out having a small stroll to get to and from dinner helped to loosen up our muscles. However, we were no way going to be doing another one of the hikes we had researched. 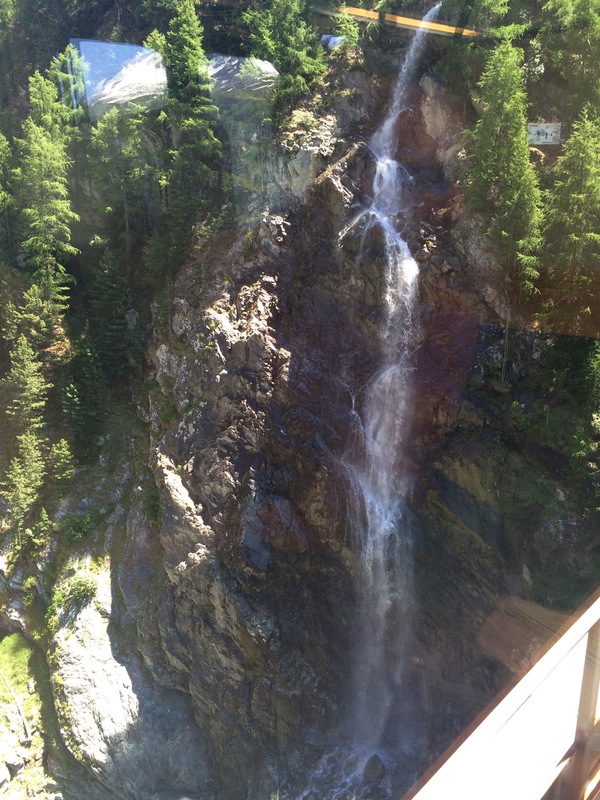 Instead we decided to take the cog-wheel rail up to Gornergrat, look around, have lunch, and take the cog-wheel rail back down in time for our train to Basel. One generous bribe of chocolate and ice cream later and we were on our way up the mountain on the train. While watching the view go by the words to “How Great Thou Art” kept going through my head. I was raised Catholic. I am more quietly spiritual than religious now, but I believe Carl Gustav Boberg must have seen something similar to inspire the poem “O Great God” that became the lyrics for the hymn. This was all lost on the boys, who were focused like bloodhounds on their quest to get ice cream and chocolate and then to see how long it would take to finagle a souvenir out of us. 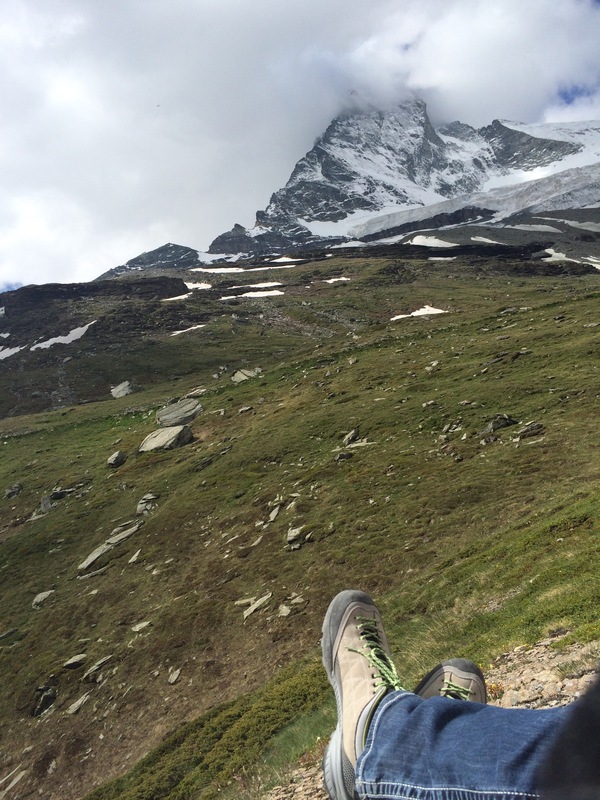 Gornergrat isn’t just another mountain. It’s also home to an observatory and has an infrared telescope mounted on top of a huge castle-like structure that also holds the Kulm Hotel and the 3100 Restaurant. We found there were a couple of snow banks hanging on for dear life. Children of all ages, including ours, were making snowballs and pelting each other while the “adults” sat at tables on the patio eating lunch, ice cream, and having drinks. E and H were having such a fun time! And let me tell you, the air is thin up there. Everyone was slowly making their way up to the summit, huffing and puffing as they kept one hand securely on a rope railing. But the view was worth it. 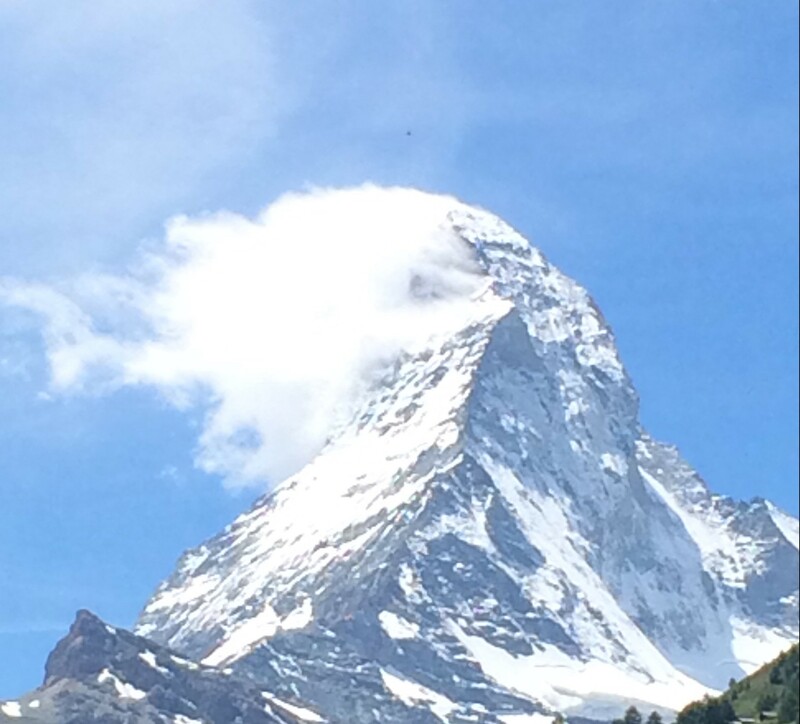 The Matterhorn to one side, Mt. Rosa to the other, and a whole line of Alps flowing out behind. The top of Gornergrat was unbelievably beautiful. Majestic, even. I hope you can see how blue the sky was that day. The photos are completely untouched. The landscape just keeps going. Me and the boys. They might actually be a little glad to be here. Mark and E. It was about 60F in the sun, really a perfect temperature for a mountain top. My lunch view. It’s all so fantastic. E, of course, brought a book to read. We were so sore all we could do without wincing was admire the view. So we put our American all in to admiring the heck out of that view. All too soon it was time to head down and catch our train back to Basel. The boys were actually reluctant to leave. 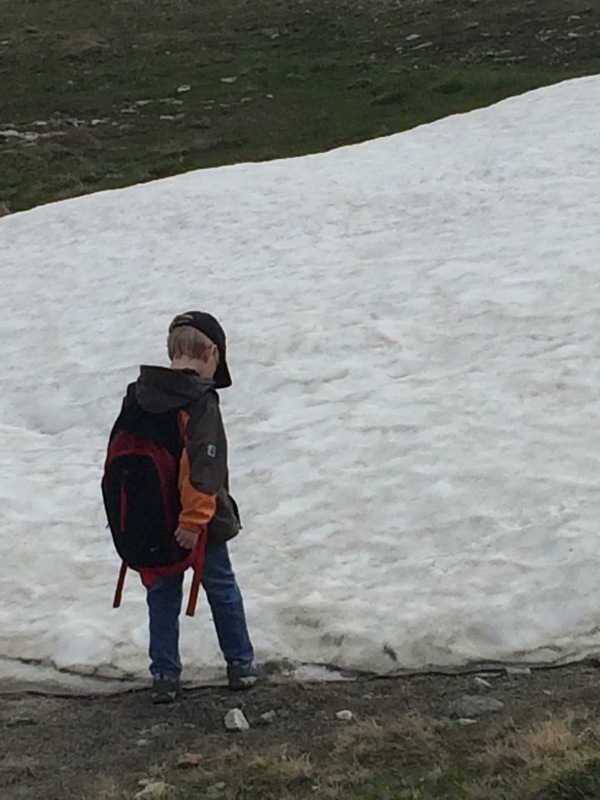 I decided to send a postcard to my niece from the top of Gornergrat and while I was busy the boys cornered Mark and weaseled souvenirs out of him. 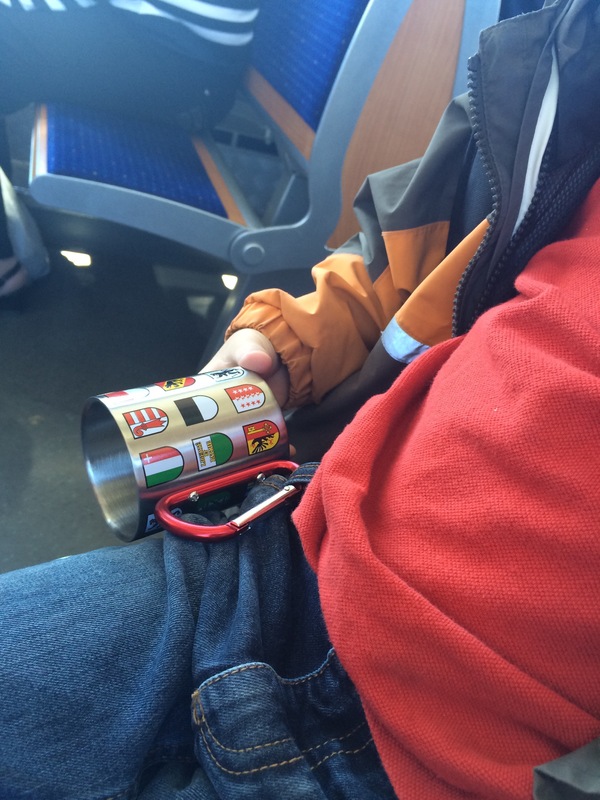 E got a cute Swiss rubber duck and H got a metal cup, which he then clipped to his pants so he’d always have it just in case there was some glacial water he could drink. 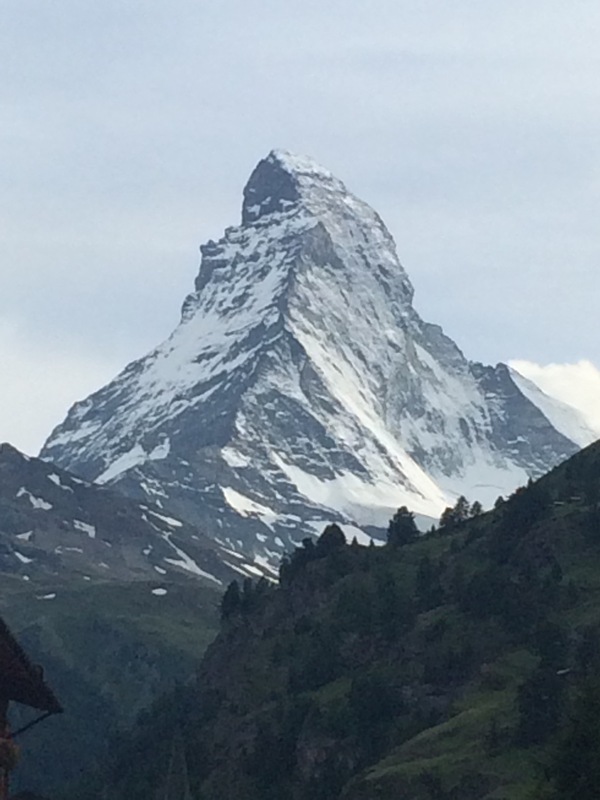 If you ever get a chance to go to Zermatt then GO. In fact, you should make time to go. 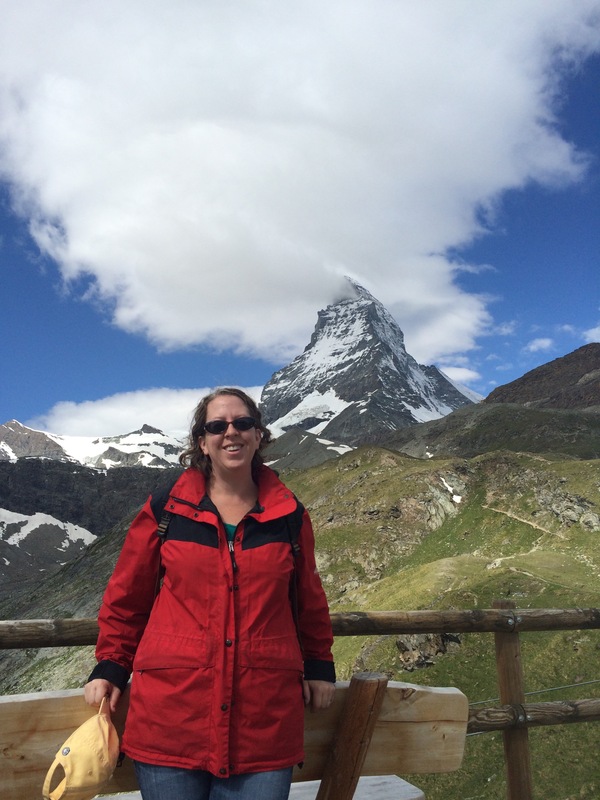 I have never been anywhere like the Matterhorn before and I doubt I will ever again. If you are worried about a language barrier don’t be. I heard more American English there than at the Mall of America. 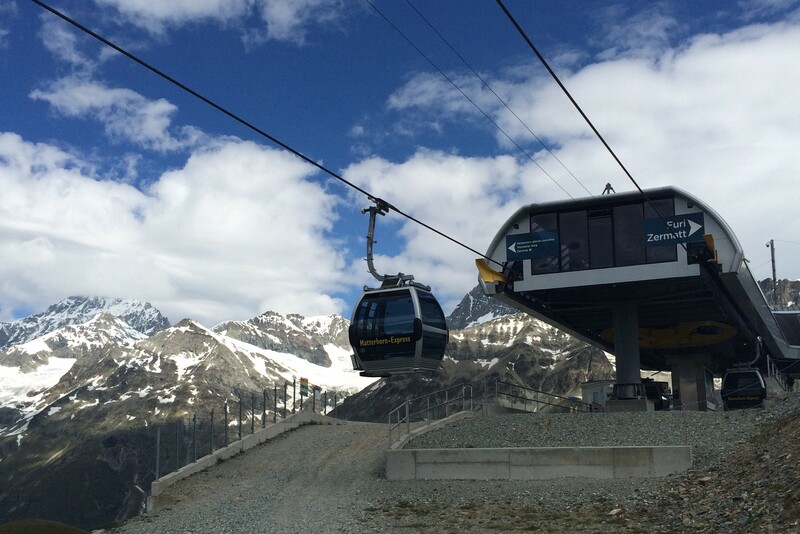 And they make getting to and from different mountain tops incredibly accessible for people of all mobilities. So GO!